All in the Family: GO JANIE, GO! When I was a little girl, I was pretty confident. I was first to raise my hand in class, introduced myself and my siblings to "new people", and even challenged babysitters on their competency. By fifth grade, I had written a letter to president Reagan, contacted Yale university about their entrance requirements and started a little business doing neighborhood chores that payed for my first puppy. My weak point was athletics. 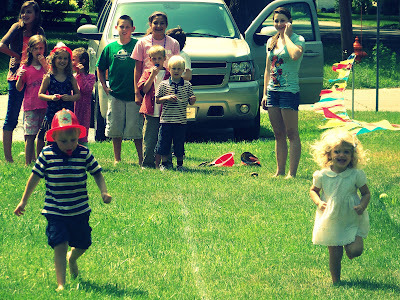 More specifically, it was running relay races. I LOATHED them. Inevitably some annoying red head boy with freckles and a stopped up nose would observe loudly, "that girl is SOOO SLOW!" It seemed to me, like some mean prank. I talked fast, thought fast, had big fast plans, even bordered on hyperactive, yet as my sister later joked, "was at odds with the physical world." I clearly remember entering a new school and having to do relay races on the first day as an "icebreaker." It was a private school and we raced down this weird carpeted hallway (I promise this was not a dream). I was on the purple team and the races last all week during recess. Each night before school I would pray that I could somehow, miraculously find SPEED. I never did. I found that feigning a fall sometimes helped (although other times it would look obvious and make matters way worse). Anyway, I'm older now - more sure of myself and my body - I've had two babies and now take a class at the Y (ymca) called "ZUMBA." I just adore Zumba. It's like Jane Fonda meets the club scene - in Miami. So I've been going to this crazy Latina dance party aerobics class for about 8 months now. Some weeks I get there more than others, but recently I've been going a lot - 3 to 5 times a week. I've even started dressing a little more Zumba-ish (tighter, tankier clothes) and feeling pretty good. So anyway, I'm dancing my heart out one morning - neither my sister-in-law or good friend were there, so I was really givin' it all I got. "Wow, I look good," I was secretly thinking to myself. I mean, granted, it was a skinny mirror, but heck, I was really getting the hang of this. Then I went to get a drink in between songs. I was pouring sweat from my efforts and a bit had gotten into my eye. "Is this your first time at Zumba," a voice asked. I wiped my eye and could see that it was the girl who had been standing behind me. My first time? What? I'm not kidding, I nearly hit her. That would have been bad. A sad ending to my family's Y membership. And then I realized: dang, I've been coming for 8 months, that really stinks that you thought that. What a reality check - I mean I truly thought that I was co-teaching that girl. Visions of the purple team relay race came swirling into focus. My sister-in-law told me later that that girl was probably just making small talk. Sure. Needless to say, it has been pure joy watching my oldest daughter Isabelle conquer the physical world. From the time she was teeny tiny, she has attempted to lift, climb, race just about anything that has entered her path. My daughter Jane has been a different story. Softer, slower, she entered the world verbally rather than physically. I thought she was a girl after my own heart - or body, rather. Well...getting to the point, this Sunday, Jane surpassed my athletic ability, shattering a box I had put her in. At the church carnival, she raced (gleefully, willingly) and BEAT her opponent (a stunning 2 year old male). Yes, Gabe may have been distracted by the toy whistle or lollipop that he had in his mouth. He may have misunderstood the object of a relay race (since he is only two). However, my daughter won the race. And instead of murmurs of, "wow, that girl is really slow " there was a soft, continuous chanting, " Go, Janie, Go." Girls after my own heart! While I was a bit shy and not writing letters to presidents, I was pretty athletic. And I would like some pictures of you in your Zumba clothes- love that story. That girl was way out of line! And, uh, Paige, uh, DON'T feel badly. Your competition is YOURSELF. Sticking to it for all of those weeks is COMMENDABLE! Now........with the boxing gloves, just punch forward - forcefully! This photo is awesome and beautiful, and I totally love your writing--hilarious, human, kinda like Anne Lamott without all the swearing. What a treat that you posted again!